Despite Thursday’s “pullback”, “takedown”, or whatever analysts want to call it, the Captain’s view is that wave !iv! is complete at the 1279.50 low and that our wave !v! rally higher is now underway. 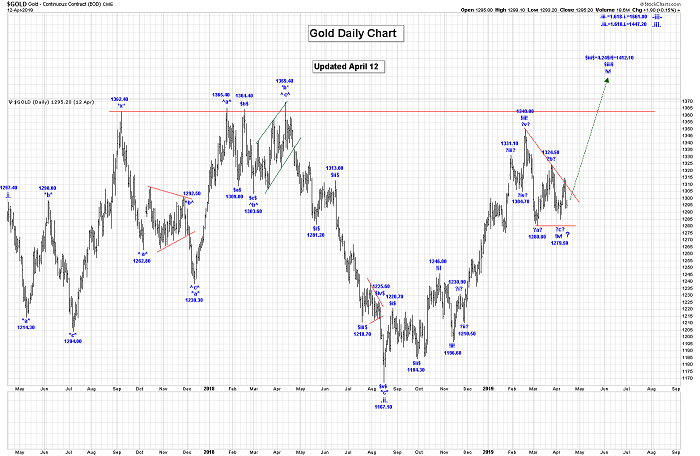 As you can see on our “Daily Gold Chart”, we need to strongly break and close above our red trendline that connects the three recent highs in this market. Once that red line is broken we will have our confirmation that all of wave !iv! is complete at the 1279.50 low. We will provide projections for the end of wave !v!, when we are sure that all of wave !iv! is complete. $iii$ = 4.25$i$ = 1412.10. We do have higher projections. Of course, wave .iii. will subdivide into a 5 wave impulsive sequence in its journey higher. 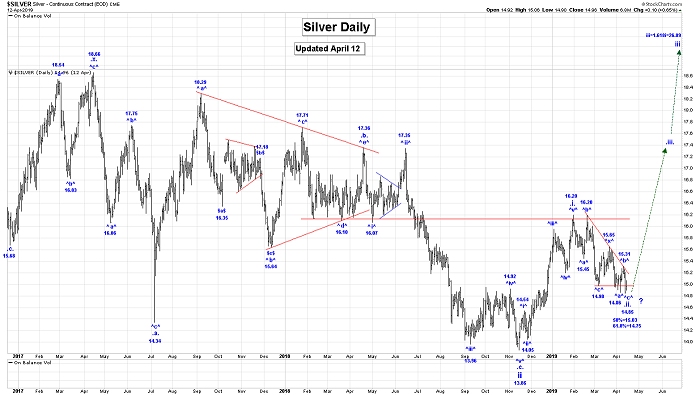 As you can see on our “Daily Silver Chart” it looks like wave .ii. has become a double 3 wave pattern, with the second wave ^c^ possibility being complete at the 14.85 low. Once wave .ii. ends we should expect a very sharp rally in wave .iii., to be the next big event in this market. As with gold, our confirmation will come when we break and close above our red trendline that connects the recent highs, as shown on the chart. We will provide our initial projections for the end of wave .iii. when we are sure that all of wave .ii. is complete. Trading Recommendation: Go long silver. Use puts as a stop. 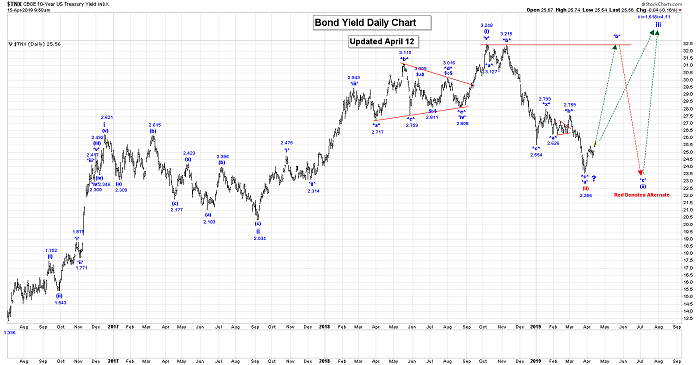 We are working on the assumption that all of wave *a* likely ended at the 2.356% low for the 10year bond yield. If this is the case, we should be now rallying in wave *b* that will become either a flat or irregular type correction. Wave *b* should rally all the way back to the start of the correction, which is 3.248%. Wave *b* could also become a bearish triangle. In the very short term we likely completed a small 5 wave impulsive sequence from the 2.356% low to the current high of 2.544%. If that is the case, then we likely completed our small correction at the 2.463% level and should therefore be moving higher again. Our alternate count is that all of wave (ii) is complete at the 2.356% low. If this is the correct count, then we should also expect this market to start to rally sharply higher in wave (iii). The 10year bond yield reached a historic low of about 1.336% on July 06, 2017 and it has started to rally higher. 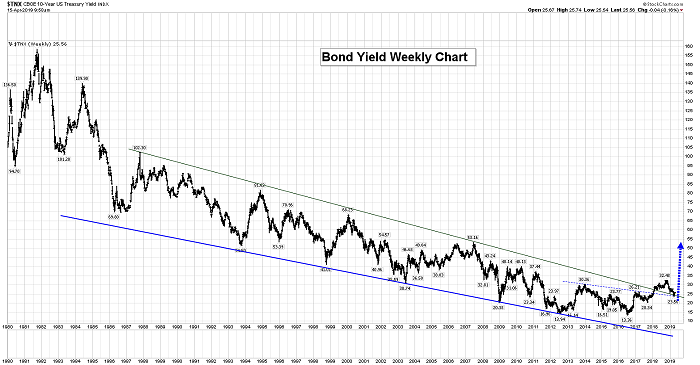 We expect that in the coming years the US 10year bond yield will rally back to at least the 15.84% level that was reached in September of 1981! Trading Recommendation: Go long, risking to 2.350%. Active Positions: Long, risking to 2.350%! Free Offer For Gold-Eagle Readers: Please send me an Email to admin@captainewave.com and I’ll send you our key “Gold Miners Reach For The Sky!” report. I include important wave counts for the CDNX and key individual miners, with tactics to help investors make money! ALL INFORMATION POSTED IS BELIEVED TO COME FROM RELIABLE SOURCES. CAPTAINEWAVE.COM DOES NOT WARRANT THE ACCURACY, CORRECTNESS, OR COMPLETENESS OF INFORMATION AVAILABLE FROM ITS SERVICE AND THEREFORE WILL NOT BE LIABLE FOR ANY LOSS INCURRED. DUE TO THE ELECTRONIC NATURE OF THE INTERNET, THE CAPTAINEWAVE.COM WEBSITE, ITS E-MAIL & DISTRIBUTION SERVICES AND ANY OTHER SUCH "ALERTS" COULD FAIL AT ANY GIVEN TIME. CAPTAINEWAVE.COM WILL NOT BE RESPONSIBLE FOR UNAVAILABILITY OF USE OF ITS WEBSITE, NOR UNDELIVERED E-MAILS, OR "ALERTS" DUE TO INTERNET BANDWIDTH PROBLEMS, EQUIPMENT FAILURE, OR ACTS OF GOD. CAPTAINEWAVE.COM DOES NOT WARRANT THAT THE TRANSMISSION OF E-MAILS, OR ANY "ALERT" WILL BE UNINTERRUPTED OR ERROR-FREE. CAPTAINEWAVE.COM WILL NOT BE LIABLE FOR THE ACTS OR OMISSIONS OF ANY THIRD PARTY WITH REGARDS TO CAPTAINEWAVE.COM DELAY OR NON-DELIVERY OF THE CAPTAINEWAVE.COM NIGHTLY EMAILS OR "ALERTS". FURTHER, WE DO NOT RECEIVE ANY FORM OF PAYMENT OR OTHER COMPENSATION FOR PUBLISHING INFORMATION, NEWS, RESEARCH OR ANY OTHER MATERIAL CONCERNING ANY SECURITIES ON OUR SITE OR PUBLISH ANY INFORMATION ON OUR SITE THAT IS INTENDED TO AFFECT OR INFLUENCE THE VALUE OF SECURITIES.